The Royal Palace at Bang Pa - In has a history dating back to the 17 th century. According to a chronicle of Ayuttaya, King Prasat Thong ( 1629 - 1656 ) had a palace constructed on Bang Pa - Island in the Chao Phraya River. A contemporary Dutch merchant, Jeremias van Vliet, reported that King Prasat Thong was an illegitimate son of King Ekathotsarot ( 1605 - 1610 / 11 ), who in his youth was shipwrecked on that Island and had son by a woman who be friended him. The boy grew up to become the Chief Minister. After having usurped the throne, he become known as King Prasat Thong. The King founded a monastery, Wat Chumphon Nikayaram, on the land belonging to his mother on Bang Pa - In Island, and then had a pond dug and a palace built to the south of that monastery. 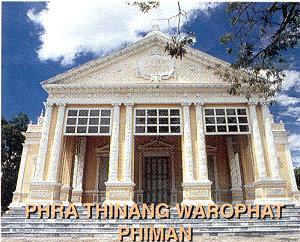 The chronicle records the name of only one building, the Aisawan Thiphayaart Royal Residence, which was constructed in 1632, the year of the birth of his son, the future King Narai (1656-1688). It is not know whether or not the palace was in use till the fall of Ayutthaya in 1767. The palace was revived by King Rama IV of the Chakri dynasty, better known in the West as King Mongkut (1851-1868), who had a temporary residence constructed on the outer Island that because the site of the Neo-Gothic style monastery, Wat Niwet Thamprawat, which was built by his son and heir, King Chulalongkorn(Rama V). The present-day royal palace dates from the reign of King Chulalongkorn (1868-1910), when most of the building standing today were constructed between 1872-1889. Phra Thinang Aisawan Thiphya - Art is a Thai - style pavilion with four porches and a spire roof built by King Chulalongkorn in the middle of and outer pond in 1876. 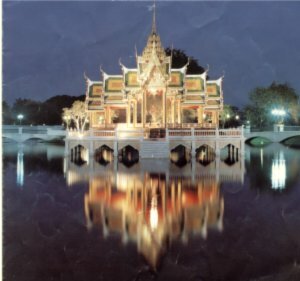 It is a copy of the Phra Thinang Aphonphimok Prasart in the Grand Palace, which was built by his father King Mongkut, as a pavilion for changing regalia before mounting a palanquin. King Chulalongkorn named this building Aisawan Thiphya - Art after King Prasart Thong's original pavilion. This pavilion now houses a bronze statue of King Chulalongkorn in the uniform of a Field Marshal which was set up by his son King Vajiravudh ( Rama VI ). Phra Thinang Warophat Phiman is a Neo - Classic style one - storey mansion built by King Chulalongkorn in 1876 as his residence and throne hall. The audience chambers and anterooms are decorated with oil paintings depicting significant events in Thai history and scenes from Thai literature. The series of historical paintings was commissioned by King Chulalongkorn in 1888. The private apartments of this building, which are located in the Inner Palace section, are still used by Their Majesties whenever they reside at Bang Pa - In Palace.